At the age of 21, Walter entered the service of the HBC, committing to a five-year term as a York boat builder. Sailing from Stromness, Orkney in June 1870, it took eight weeks to reach York Factory. He continued his westward journey, by York boat and dog sled, reaching Fort Edmonton on Christmas Eve. Walter’s arrival coincided with a time of great change in the Northwest. The previous year, the HBC signed the Deed of Surrender relinquishing Rupert’s Land to the Dominion of Canada in exchange for a large sum of money and the retention of land around each of its posts. After two centuries, HBC authority in the Northwest was at an end, and Canada’s newly acquired territory presented the prospect of great opportunity. In 1876, Walter chose not to renew his contract with the HBC. Settling on the south side of the river, he selected a plot of land opposite Fort Edmonton, becoming one of the first residents of modern-day Strathcona. Granted official title in the Land Survey of 1882, Walter’s Lot 9 encompassed 155 acres that extended east and west from modern-day 107th Street to 109th Street as far south as University Avenue. In the early years, he built a two-story log house and established himself as a boat builder, continuing to build York boats for the HBC as well as other vessels like rowboats, scows, dredges and steamboats. John Walter & Family, 1888. Image courtesy of City of Edmonton Archives EA-10-1677. In 1882, Walter launched his most recognized operation, a cable ferry linking the growing settlements of Edmonton and Strathcona. From Winnipeg he procured the materials, transporting more than a half-ton of cable across the prairie by ox-cart. Running on a stretch of river between today’s 105th Street and the High Level Bridge, the ferry was capable of transporting a wagon and team one at a time. Operating until the construction of the High Level Bridge in 1913, it served as a lifeline connecting the two sides of the river. Walter’s Ferry, 1909. 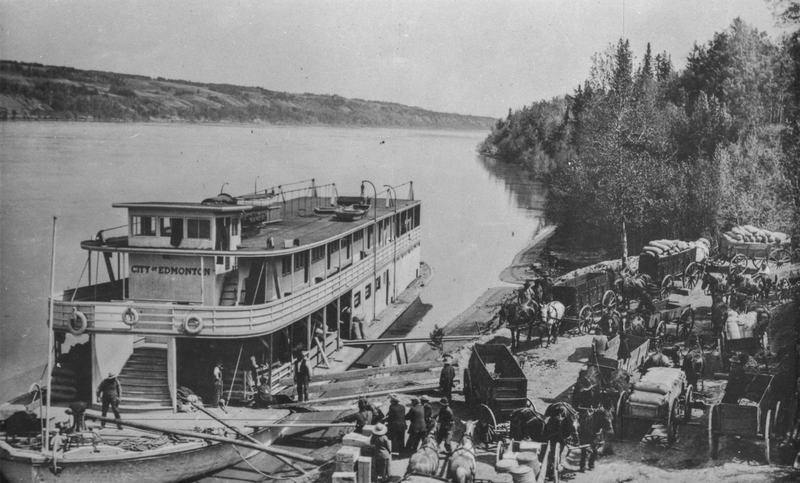 Description: John Walter’s ferry carrying a horse and buggy across the North Saskatchewan River. Photographed by Gordon Wilkins. Image courtesy of City of Edmonton Archives EA-793-124. As Walter’s boat building business steadily grew, his worksite, which had come to be known as Walter’s Flat, expanded to include a blacksmith and carriage shop. The success of his businesses coupled with the growing demand for building materials prompted him to open his first sawmill in 1893. Timber was primarily taken from the banks of the North Saskatchewan where it could easily be floated downstream to the sawmill. In 1895, Walter purchased a timber limit at Big Island (16 miles upstream) and the following year, harvested 300,000 feet of timber. 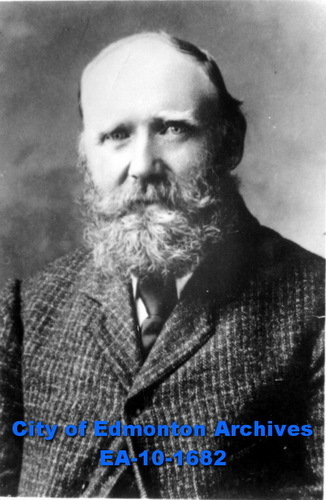 Considered his most successful business venture, Walter’s lumber business grew with the population, supplying the materials for many of Edmonton’s early structures. Opening a second sawmill on the river’s north bank in 1901, his sawmills and lumber operations were one of Edmonton’s largest employers. In the early 1900s, Walter’s workshops built two steamboats, the Strathcona (rechristened the Scona) and the City of Edmonton. Hauling freight and transporting passengers along a 200-mile stretch of river, his steamboats provided an essential service connecting the frontier’s early settlements. On weekends and holidays, Walter also offered summer excursions, which were very popular. The larger City of Edmonton could hold up to 400 passengers and accommodate both a band and a dance floor. A favorite destination was Big Island. An all-day event, a trip to Big Island commenced with a scenic cruise upriver, followed by a day of picnicking in the outdoors, and a homeward journey filled with music and dancing. 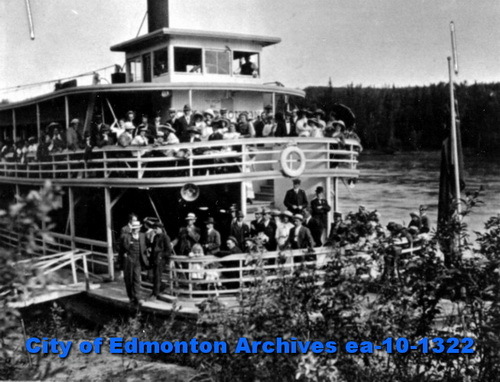 Paddle Steamer “ City of Edmonton”, 1910. Description: “The City of Edmonton” paddle steamer being loaded at dock. Image courtesy of Provincial Archives of Alberta A7011. Steamer – Excursion to Big Island, n.d. 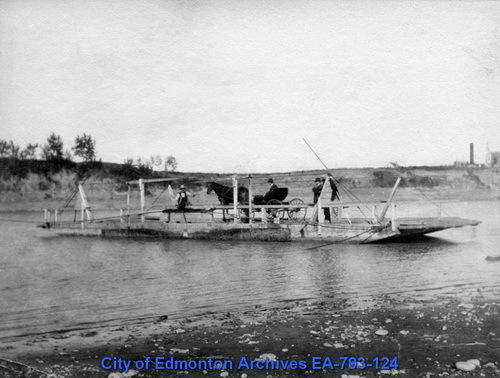 Description: Transportion – Steamer (City of Edmonton). 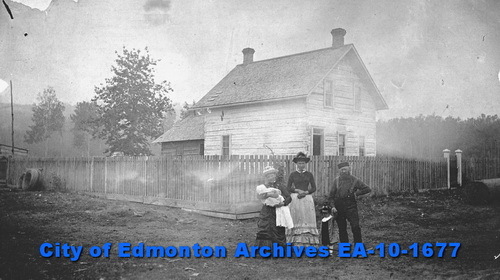 Image courtesy of City of Edmonton Archives EA-10-1322. In the latter years of his life, Walter’s businesses were afflicted by a series of unlucky events. In 1907, six men were killed in a fire at the Strathcona Coal Company Mine. Walter was part owner and was deeply affected by the incident. In 1908, spring floods caused the log boom at his mill to burst, carrying away between $50,000- $100,000 worth of logs. In 1913, fire claimed one of his commercial buildings. However, it was the flood of 1915 that took its greatest toll. Recorded as the worst flood in Edmonton’s history, Walter’s riverside businesses were devastated. His mills were destroyed and hundreds of thousands of dollars worth of stockpiled lumber was washed away. Crippled financially, he was never able to fully recover from his losses. The river that made his fortune had also destroyed it. Barris, T., 2015. Fire Canoe: Prairie Steamboat Days Revisited. Toronto: Dundurn Press. Cashman, T., 1976. The Best Edmonton Stories. Edmonton: Hurtig Publishers. Cashman, T., 2009. When Edmonton was Young. Edmonton: University of Alberta Press. Goyette, L. and Roemmich, C.J., 2004. Edmonton: In Our Own Words. Edmonton: University of Alberta Press. MacGregor, J.G., 1967. Edmonton, A History. Edmonton: M.G. Hurtig Publishers. Saturday News, 1908. To Fort Saskatchewan by S.S. Strathcona. Saturday News. [online]. Aug.1. p6. Available from http://peel.library.ualberta.ca/newspapers. [Accessed 20 March 2017]. Strathcona Evening Chronicle, 1907. Hospital Board Get to Work. Strathcona Evening Chronicle. [online]. June 5. P4. Available from http://peel.library.ualberta.ca/newspapers. [Accessed 21 March 2017]. Strathcona Evening Chronicle, 1908. Heavy Flood and Loss of Logs. Strathcona Evening Chronicle. [online]. June 8. p1. Available from http://peel.library.ualberta.ca/newspapers. [Accessed 21 March 2017]. The Edmonton Bulletin. 1895. Local. [online]. Jan. 14. P1. Available from http://peel.library.ualberta.ca/newspapers. [Accessed 15 March 2017]. The Edmonton Bulletin. 1886. Blacksmith and Carriage Shop. The Edmonton Bulletin. [online]. May 8. p3. Available from http://peel.library.ualberta.ca/newspapers. [Accessed 02 April 2017]. The Edmonton Bulletin. 1912. Small Expenditure Would Make Saskatchewan Good Trade Route. The Edmonton Bulletin (Morning Edition). [online]. April 13. p16. Available from http://peel.library.ualberta.ca/newspapers. [Accessed 11 April 2017]. The Edmonton Bulletin. 1913. $100,000 Fire Destroys Douglas Bros.’ General Store on South Side. The Edmonton Bulletin. [online]. Oct. 27. p1. Available from http://peel.library.ualberta.ca/newspapers. [Accessed 15 April 2017]. The Edmonton Bulletin. 1913. Ferry Service Old Landmark Passing Away. The Edmonton Bulletin (Morning Edition). [online]. Nov.1. p1. Available from http://peel.library.ualberta.ca/newspapers. [Accessed 15 April 2017]. The Edmonton Bulletin. 1914. The John Walter Company. The Edmonton Bulletin [online]. April 30. p4. Available from http://peel.library.ualberta.ca/newspapers. [Accessed 15 April 2017]. The Edmonton Bulletin, 1915. Saskatchewan River was 24 Feet Above Low Water Mark Last Night. The Edmonton Bulletin. [online]. 28 June. p1. Available from http://peel.library.ualberta.ca/newspapers. [Accessed 3 April 2017]. The Edmonton Bulletin. 1920. John Walter Dead – Early Pioneer and Sterling Citizen. [online]. Dec 27. p3. Available from http://peel.library.ualberta.ca/newspapers. [Accessed 31 March 2017]. The Edmonton Capital. 1911. Council in Favour of Amalgamation. The Edmonton Capital. [online]. Jan.11. p8. Available from http://peel.library.ualberta.ca/newspapers. [Accessed 15 April 2017]. Actually, Laurent Garneau’s River Lot 7 extended to 108 Street. Walter’s River Lot 9 ran from 108 to 106 Streets. Hi, after reading this very interesting article that has some connection to boat building in Edmonton, I was wondering if you would be interested in publishing a story about another boat building company in Edmonton in the early 1900’s. That would include an interesting connection about one of their boats that ended up hauling HBC freight on Reindeer Lake in far northeastern Saskatchewan. Hi Les, sure, we would love to hear about it! Can you e-mail me at courtney.lakevold@gov.ab.ca with the details? Thanks! !